Services and celebration of Mattie Faye Stricklin will be held Wednesday, Jan. 12, 2011, at 1:30 p.m. at Swan-Wood Springs United Methodist Church, 12005 U.S. Highway 69 North, Tyler/Swan. Burial will follow in Bullard City Cemetery. She was born April 22, 1924, and entered the presence of Jesus on Jan. 8, 2011, in Dallas. She gracefully transitioned from Earth to her Eternal Home, with family members by her side. She is rejoicing with her Savior, her precious George, family and friends. Faye faithfully served her family as wife, mother and homemaker. She worked with her husband, George Stricklin, in various small businesses in Dallas and Tyler. Faye loved to laugh, was creative and enjoyed making her home a place of welcome and comfort. Her greatest joy was spending time with family and friends. Faye was preceded in death by her husband, George, of 59 years. Also preceding her were parents, Richard and Mattie Reid, and 12 siblings. 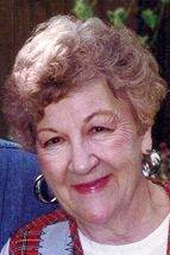 She is survived by two sons and their wives, Joe and Bobbie Stricklin, Doug and Elizabeth Stricklin, and one daughter and her husband, Dianne and Wendell Merritt; 14 grandchildren, Dori, Brad, Neil, Brandy, Dyron, Wayne, Timothy, Caleb, Alex, Mattie, Wendy, Jamie, Sindy, Bill; 11 great-grandchildren; brother-in-law and sister-in-law, R.L. Henderson and Nell Fain; and many nieces and nephews. Pallbearers are Brad Stricklin, Neil and Timothy Merritt, Caleb Stricklin, Joe Carl Reid and Ronnie Reid. Honorary pallbearers are Dyron Stricklin, Wayne Merritt, Preston Reid, Ken and Randy Henderson. The family wishes to thank the staff of The Cove at C.C. Young of Dallas and Seasons Hospice for the outstanding support, care and love for their mom. Contributions may be made to C.C. Young Staff Fund of The Cove Memory Loss Unit, 4847 W. Lawther Drive, Dallas, 75214. Visitation will be at Burks Walker Tippit in Tyler on Tuesday, Jan. 11, from 6 to 7:30 p.m.